The magic of this book begins in the front material with a depiction of a child's legs in yellow, full-of-stars footy pajamas who is dragging a stuff monkey across the opening's spread. Somewhere, anywhere, a child is getting ready to go to bed. A reader can already tell that this book is going to be special. Gentle quatrains with an a-b-c-b rhyme scheme ponder what animals dream about as they dream about us. With some of the quatrains appearing across the spreads in couplets, the reader gets a real sense of VanDerwater's thoughtful presentation and rhythms. Blush-cheeked turtles and wide-eyed owls each welcome the listener to dream time.Aaron DeWitt's illustrations are the stuff of classic children's literature with quiet presentations of the animals as they prepare for bed themselves thinking about what they might do in the day.I love that VanDerwater is creating more and more poetry for children. Nothing is lost in her ambition as a poet and as an enthusiast of children's poetry. Her Read, Read, Read last fall was a love letter to readers everywhere and her forthcoming collection, With My Hands is also an example of VanDerwater's passion for and commitment to poetry for the younger audience.Dreaming of You earns the distinction of being a One Book/Four Hands title and it is sure to make a wonderful gift book for parents of young ones for bedtime reading. This review was originally written for The Baby Bookworm. Visit us for new picture books reviews daily!Hello, friends! 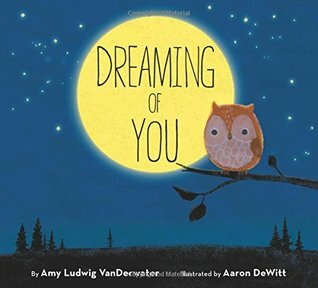 Our book today is Dreaming Of You, written by Amy Ludwig VanDerwater and illustrated by Aaron DeWitt, a charmingly sweet bedtime book filled with animal friends.What do animals dream of when it’s time for bed? Well, all sort of things. Kittens dream of lapping fresh milk, turtles dream of sunning themselves on the rocks, fireflies dream of dancing in the cold moonlight. But perhaps you might be surprised to find that all these lovely animals enjoy nothing more than to dream of you. For instance, puppies dream of cuddling in a warm bed with you, and horses dream that you’ll whisper secrets into their soft ears. So as you drift off to sleep tonight, enjoy your lovely gentle dreams, and know that creatures great and small are dreaming of you, too.Delightful yet wonderfully soothing. The poem that comprises the text flows gorgeously, with flawless rhythm and delicate, whimsical rhyme. The concept deftly treads a line between adorable and saccharine, keeping an earnest air of preciousness without veering into “cutesy”. The art is lovely, blending the look of oils, pastels and mixed-media into a style that looks classic but feels fresh. The length is perfect for a bedtime read, and JJ and I adored it. A wonderful selection for helping little animals lovers wind down, and it’s Baby Bookworm approved! (Note: A copy of this book was provided to The Baby Bookworm by the publisher in exchange for an honest review. )Be sure to check out The Baby Bookworm for more reviews! One of the sweetest goodnight books ever! Amy Ludwig VanDerwater - Amy Ludwig VanDerwater is author of children’s books including FOREST HAS A SONG (Clarion), EVERY DAY BIRDS (), and READ! READ! READ! (WordSong). She is also author of POEMS ARE TEACHERS (Heinemann) and co-author of POETRY: BIG THOUGHTS IN SMALL PACKAGES (Heinemann). A former fifth grade teacher, Amy received her MA from Teachers College, has taught writing for nineteen years, and blogs at The Poem Farm and Sharing Our Notebooks. Amy lives in Holland, NY with her family, and online at amyludwigvanderwater, The Poem Farm Facebook page, and on Twitter and Instagram @amylvpoemfarm. Two new books coming in 2018!